When winter comes and snow falls on the many mountain peaks of Washington State, plenty of skiers hit the the local ski areas and resorts. However, for a change of pace—or for those who want to get a winter workout without hurtling down a slope—cross-country skiing is a fine option. And finding a place to go cross-country skiing in Washington State is easy with plenty of ski areas, forests and trail systems. But where to go? Whether you’re looking for a simple set of trails for a first time out on some cross-country skis, for a guided tour or for more advanced trails, read on. And always double check which permits you may need to head out on the trails as sometimes you’ll need more than one. With more than 28 kilometers of machine-groomed trails, the Stevens Pass Nordic Center is perfect for cross-country skiers, snowshoers and skate skiing. The trails follow along the bottom of Jim Hill Mountain, guaranteeing plenty of pristine alpine scenery to enjoy during your workout. Since this is a center, you can also expect gear for rent if you need it, lessons for all abilities, a shop, and food and snacks to refuel. Stevens Pass Nordic Center also hosts biathlon races as well as safety courses for those interested in learning to compete. Located accessibly close to Seattle, the Summit at Snoqualmie’s Nordic Center is perfect for cross-country skiers who want a centrally located place to go. With more than 50 kilometers of groomed trails, Snoqualmie has tons of places to explore, too. If you’re an accomplished cross-country skier, get a trail ticket, check the maps and conditions and be on your way. If you have no idea where to start, maybe a lesson will help, and lessons are available for beginners and practiced skiers alike. Likewise, if you’re a beginner, there are two kilometers of trails just for you, including the first part of the Cold Creek Trail. Lake Wenatchee has a few things going for it—more than 30 miles of cross-country skiing trails that offer terrain along Wenatchee River, along Lake Wenatchee’s shoreline, through backcountry and more. There’s also the Chiwawa Sno-Park that has a skate lane and single track, as well as both groomed and ungroomed terrain. Trails are not groomed every day of the week so check ahead for your planned route to find out when it will be in shape for your ski. There’s enough for beginner skiers, as well as spots like Nason Ridge that provides a challenge for those who want a good hill climb. Count on views of mountains and the lake. Also count on close proximity to adorable mountain Bavarian town Leavenworth where you can warm up with some tasty German food afterward! Cabin Creek Nordic Ski Area is just off exit 63 on I-90 and is a scenic and pretty place to cross-country ski in Central Washington. Trails include a mix of easy, intermediate and expert level terrain, all of which are well groomed by the Kongsberger Ski Club on both weekdays and weekends. Races do take place on the trails so check ahead to make sure they are open to the public when you want to go. These trails are popular so you might not find yourself alone, but they’re so great to ski that you won’t care. 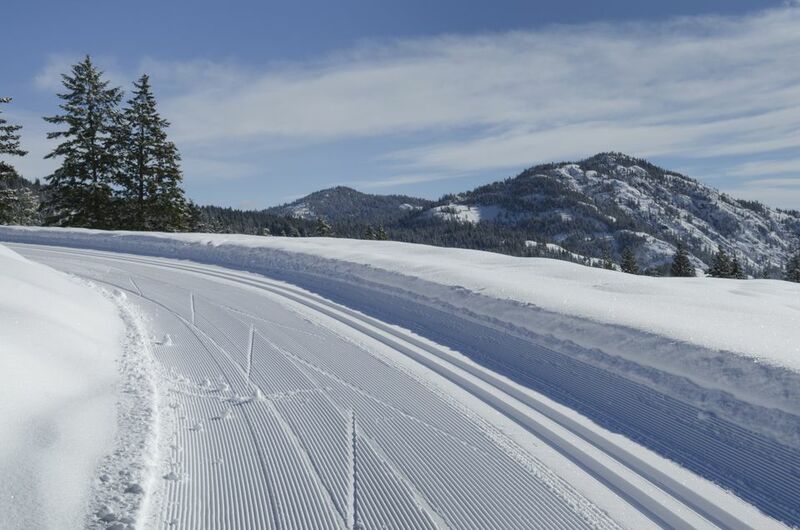 With more than 200 kilometers of wintery trails, the Methow Valley is known as one of the biggest and best Nordic trails systems in the entire U.S. How impressive is that? Though this location is a bit of a drive as it’s in North-Central Washington, you can’t do better if what you seek is sheer size and variety. There’s literally a trail for every skill level and plenty of different scenery to choose from to boot (or to ski boot). The Palouse to Cascades State Park Trail (formerly the Iron Horse State Park Trail) is a result of the Rails-to-Trails program, as is its appealing level terrain. The trail was once part of the Chicago-Milwaukee-St. Paul-Pacific Railroad and makes its way through forests, along rail trestles, and has views of Keechelus Lake and Mount Catherine. Due to its fairly level terrain, this trail is great for beginners and families, as well as for those who want to want to speed along. It’s easy to make this an out-and-back trail, but skiers can also bring two cars and park at Crystal Springs Sno-Park to make this a one-way trip. Located in Mead, Mount Spokane State Park has one of the vastest networks of trails in the state—more than 50 kilometers of trails, to be exact! The trails are great for both classic and skate skiing and are groomed five days a week. Ski your way through forests and open meadows covered in snow, all of which have some pretty spectacular views. Of course with so many trails, there’s plenty of room for intermediate and expert cross-country skiers, but you’ll also find lots of families hitting the trails as there’s plenty of flat track for all levels. White Pass is a ski area great for all levels and all ages. It’s popular with families for its approachable size. But there are still 18 kilometers of trails—which is plenty for most—that range from easy to difficult. For beginners, look to the Deer Creek Loop. More advanced skiers will enjoy the Zig Zag Loop or The Hill. If you don’t have your own equipment, you can rent some from the Nordic Yurt as well as trail maps and info, if you need some guidance. There are also lessons available.